"It just makes you think how difficult it must have been for them, joined together, that they were prepared to go through this operation and risk dying," says Fatimah Khanoum, a cleaner from South Tehran. As she talks about the death of the conjoined twins, Laleh and Ladan Bijani, she bursts into tears. "I would have liked to be in a position to help them in any way possible," she says. "They were like my own children." "I was expecting this would happen," said Parveneh, adding that many Iranians feared one of the twins might die. "We wanted both of them to live as they're our fellow Iranians," said Hussein - though he said even if they had been foreigners, it would have been important for him. "The difference is our media has given prominent coverage to them because they're Iranian," Hussein explains. "We were all hoping for a successful outcome to the operation, we were praying for them to be successfully separated," said a spokesman for the Iranian government, Abdollah Ramanzadeh, who described the nation as "in deep sorrow". The government offered on Monday to pay for the expenses of the two sisters, whose family had been collecting donations from well-wishers. Iranian television went live to Singapore in the morning to bring its viewers the sad news but many heard about it by word of mouth - receiving telephone calls from friends while at work. Everyone described the first twin to die, Ladan, as the more outspoken of the two girls - the one who wanted to be a lawyer and who was less fearful about the operation than her sister Laleh. The girls have been household figures for years, with the local media charting their progress through university where they studied law. In recent days the interest became more intense. One newspaper even had a poem from a reader entitled "Hoping to See you Soon" about the twins. There were long articles giving the history of the girls, explaining that they were born into a very poor family of nine children in Firouzabad in the south of Iran who could not afford to look after them. They were sent to a children's home, but one day when their mother went to visit them she found they had been transferred to another town. She told reporters the family was too poor to afford the bus fare to go and see them. The sisters were later adopted but, press reports say, their foster father had problems getting two separate birth certificates for them. The authorities initially wanted to give just one, but he fought the issue insisting they were two different people. It was only when the girls were aged 15 that their mother managed to find them again in a town near Tehran. 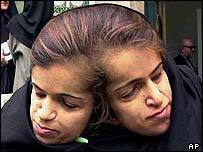 At first, the Iranian papers say the twins refused to accept they were related to their mother until they saw their younger sisters who resemble them. Before leaving for Singapore, Laleh and Ladan went home and the whole village prayed for success in their operation. Many who were following the story of Laleh and Ladan were planning to distribute sweets to celebrate if the operation had turned out well. Now they are wondering if there is going to be a memorial service here they can attend.